Weighty Matters: Shocker - Kids' Meals in Restaurants have too many Calories! 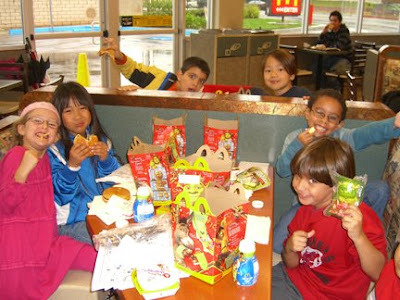 Shocker - Kids' Meals in Restaurants have too many Calories! Apropos to my post from yesterday is a story that broke embargo at noon and honest to goodness, I had no idea it was going to hit. It was from one of my favourite groups, the Centre for Science in the Public Interest (CSPI), the non-profit nutritional advocacy group who also publish the informative and surprisingly affordable monthly newsletter Nutrition Action (ad free and only $24 per year). They calculated the Calories in 1,474 different kid meals available at big chain fast food and semi-fast food restaurants. 93% of them had more than a third of the Calories an average child would need in a daytime and 86% were too high in sodium. So going back to yesterday...if activity rates haven't changed in the past 30 years and obesity rates have tripled.....and if restaurant meals for kids have too many calories as do restaurant meals for adults....and if eating out Calories now account for a full 1/3 of daily kid Calories ya think there be a connection? Oh, and about the recommendation that when you eat out you should just substitute for healthier fare - two comments. Firstly, healthier does not mean lower in Calories and many foods thought of as healthy may in fact be surprisingly unhealthy. Case in point, substitute chocolate milk for soda and you might well be providing your children with more Calories, saturated fat and sugar than the small soda had in the first place. Secondly, how many of you think your kids will let you get away with ordering Burger King's new apple fries in place of real ones? In addition to? Maybe. In place of? Forget about it. Easy bottom line here. Worried about your kid's weight? Don't (or only very rarely) take them out to eat.